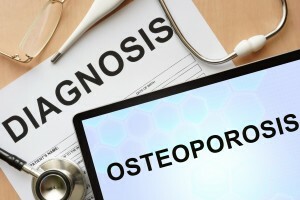 Osteoporosis diagnosis usually comes after a fracture or fall, when the weakened bones have caused the damage but it can also be something which you are tested for and diagnosed with, if you are deemed at risk of developing the disease. Osteoporosis usually develops as we age but this isn’t always the case and below we’re looking at the more formal methods of diagnosis and treatment for managing the condition. For individuals who haven’t discovered the disease through a fracture or injury, a DEXA scan can be used. Quick, safe and painless it measures your bone mineral density and compares this to the density of a healthy young adult and someone of your age and gender. The difference between your result and that of the healthy young adult bones will then be calculated as a standard deviation and is known as the T score. A T score of -2.5 or more is defined as indication of osteoporosis. The scan isn’t taken as read alone though and your doctor will also take into consideration your age, gender and any previous injuries before planning a treatment plan or deciding if you need any treatment at all. All the treatment provided for osteoporosis is dependent on the individual situation and should be undertaken only on the advice of a doctor. There are a wide range of different prescription medications which may be offered for osteoporosis including bisphosphonates, teriparatide and parathyroid hormone, Denosumab, Raloxifene, Calcitonin, Strontium ranelate and HRT. Many people do not need or choose not to take medication for osteoporosis but it is essential that you maintain sufficient levels of calcium and vitamin D, which may mean changing your diet or taking supplements. Osteoporosis is a condition which in many instances can be lived with, with relatively little difficulty, provided you manage to avoid falls and injuries. Being cautious and taking advice on your diet and exercise can help too. Simple changes in the home can help reduce the risk of a fracture or serious injury due to a fall. Checking your home for hazards is the first step and rubber mats should be in place around sinks to avoid slipping on water. Regular sight and hearing tests will ensure you don’t need new glasses or hearing aids. Some older people may also be prescribed medical hip protectors to help cushion falls. Regular exercise and a healthy diet are both key to managing osteoporosis. It can seem counterproductive to exercise but the right exercises can help to alleviate any pain and exercising can in fact increase bone strength and reduce tiredness. Your doctor will advise if you need to boost your diet with additional Vitamin D and calcium-rich foods. Do you have questions about Osteoporosis? If you have any questions about osteoporosis or would like to book an appointment with Dr Stephanie Barrett then please get in touch here.